This hotel boasts a central location in Jaca. It is located close to many of the area's most prominent attractions. Guests will find themselves just 20 metres away from links to the public transport network, which offer ease of access to other areas to be discovered. The hotel enjoys a charming design. The guest rooms are tastefully designed, and well equipped with modern amenities. The hotel offers a charming restaurant, which serves a variety of culinary options. The hotel's facilities are complemented by excellent service and friendly, professional staff. Guests are sure to enjoy a truly memorable experience at this wonderful establishment. Take advantage of recreational opportunities offered, including a spa tub, a steam room, and a fitness center. Additional amenities at this hotel include complimentary wireless Internet access, tour/ticket assistance, and a banquet hall. Take advantage of recreation opportunities such as bicycles to rent or take in the view from a terrace and a garden. Additional amenities at this hotel include wireless Internet access (surcharge) and a television in a common area. Nestled in the picturesque mountain scenery of Jaca, this enchanting hotel is recommended for group holidays or for large families. The area offers various shops, cafeterias, bars and restaurants, just a few minutes away from the property. Links to the public transport can be reached comfortably on foot and within 300 metres guests may discover the imposing Jaca Cathedral. This affordable establishment offers a simple décor and warm hospitality. The accommodation options range from single to quadruple rooms. The units offer cosily appointed and feature modern amenities to ensure a fully comfortable and memorable stay. Every morning guests may enjoy a delicious breakfast and delight in local specialties and tapas at the charm of the typical Spanish bar situated on the premises. Travellers may inquire with the friendly staff at the reception for the best places to visit in the area. Make yourself at home in one of the 124 air-conditioned rooms featuring minibars. Complimentary wireless Internet access is available to keep you connected. Bathrooms have bidets and hair dryers. Conveniences include desks, and housekeeping is provided daily. 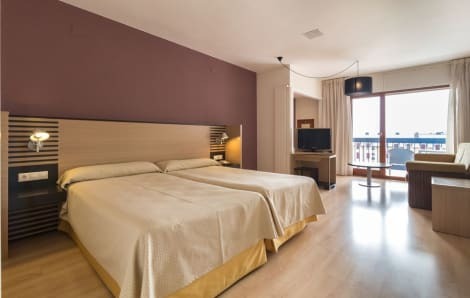 lastminute.com has a fantastic range of hotels in Jaca, with everything from cheap hotels to luxurious five star accommodation available. We like to live up to our last minute name so remember you can book any one of our excellent Jaca hotels up until midnight and stay the same night.